The fence around the old Velsicol Chemical Plant site in St. Louis, Michigan. Jane Keon is with the Pine River Superfund Citizen Task Force. "I hope it translates into more money," says Keon. "We are desperate for money from Washington, D.C."
Keon says she's choosing to see Pruitt's statements on the importance of the Superfund program in a positive light. "Our Michigan congresspeople in Washington D.C. have assured us they are not going to agree to that (cutting funding)," says Keon. "In fact, they're going to push for more money in the Superfund part of EPA." 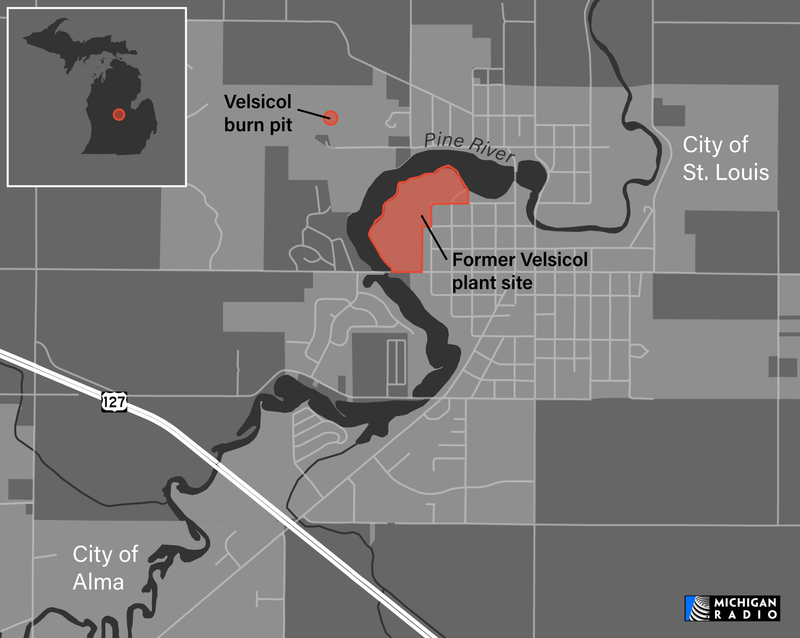 Toxic chemicals are leaking from a closed chemical factory near the Pine River. You can read more about what's going on (or rather, what's not going on) in St. Louis here. Keon says a contractor could start on a cleanup immediately, but so far, no one has approved the money to clean it up. There are 64 other Superfund sites in Michigan. The City of St. Louis, Michigan needs a new water system. That’s because pollution from the old Velsicol Chemical plant is leaking into St. Louis’ water supply. They’re planning to get that water upriver from the city of Alma. 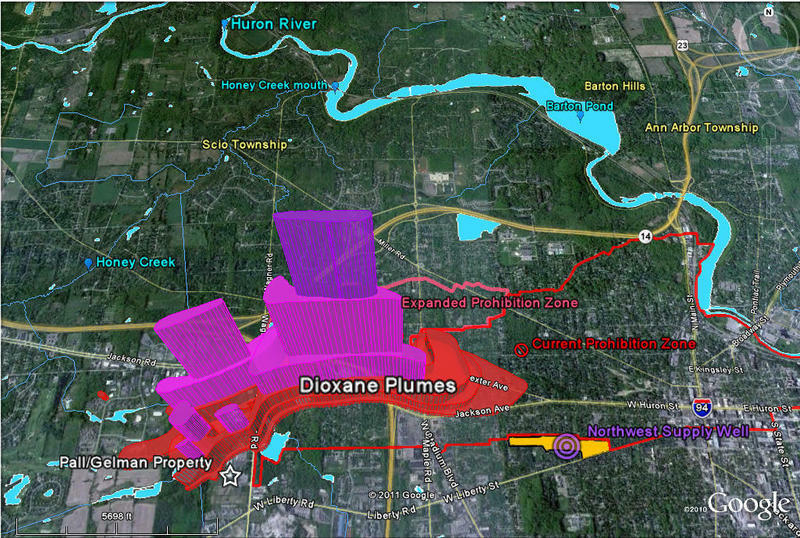 What's the fate of one of the largest pollution cleanup projects in Michigan? There are a lot of former industrial sites in Michigan that need to be cleaned up. The pollution left behind in one town in the middle of Michigan is particularly bad. The Velsicol Chemical Company (known as Michigan Chemical up until 1976) produced a lot of toxic chemicals in St. Louis, Michigan. Kalamazoo officials say they're not happy about a federal plan for dealing with contaminated soil in the city's Edison neighborhood. The site is part of an 80-mile-long area included in the Superfund cleanup program. Paper mills that occupied the site for a century left behind 1.5 million yards of soil tainted with toxic PCBs, some of which are already in a local landfill. The Environmental Protection Agency has proposed spending $36 million to dig up more soil, add it to the landfill and cover it. Kalamazoo Mayor Bobby Hopewell told the crowd the Kalamazoo City Commission would stand behind them and protect them. The waste doesn't belong in a neighborhood, he said. "The bottom line is we stopped them once and we're going to stop them again," Hopewell said of the EPA, referencing a past plan to dump PCB-laden soil from Plainwell on the Allied site. "This is unacceptable," Hopewell said. "It's poison in the middle of the neighborhood. It's unacceptable." Public Services Director Bruce Merchant says more should be done to protect an aquifer beneath the site that supplies 40 percent of the city's drinking water. The EPA says removing all contaminated soil and taking it to another landfill would cost $336 million.